As the NFL regular season comes to a close, it’s time to take a look at some of the predictions we’ve made this year. 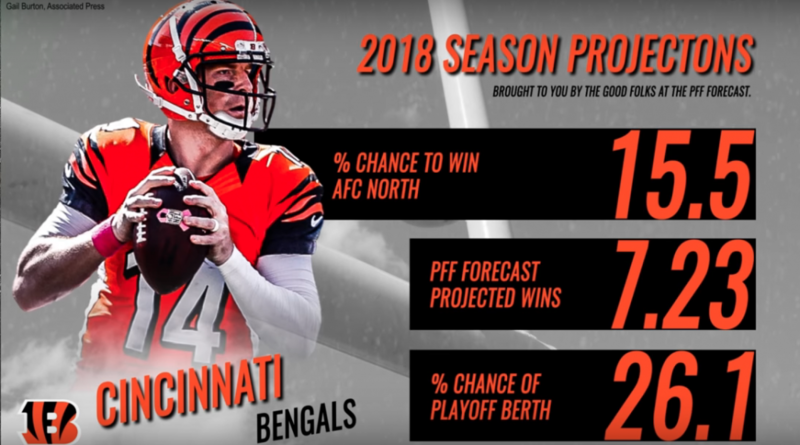 For the first offseason in PFF history, we built a simulation of the entire season and used this simulation to take a look at some win totals we found appealing. Starting with a really short (and, as it would have it, just short enough) opening win total for our hometown Bengals pre-draft and ending with a video discussing how the Colts and the Giants would go over 6.5 and under 7 wins, respectively, this model has offered good insight into the 2018 regular season. Starting with next week, we are going to offer the model’s predictions (which relies heavily on the PFF ELO rating system) for the upcoming NFL playoffs. Buckle up! Until then, we review our five printed win total picks, as well as the Colts OVER 6.5 projection in the aforementioned video. This number elevated after the draft, but those lucky enough to get this number had what appeared to be a sure thing with the Bengals starting 4-1 and eventually 5-2. They finally got over this number in week 15 with a convincing home win against the Raiders (see below), behind backup quarterback Jeff Driskel, who replaced Andy Dalton when he went down for the season with an injury. While our pick here was largely due to a prediction that the Bengals defense –strengthened by third-year cornerback William Jackson and front-four stalwarts Carlos Dunlap and Geno Atkins –would take the next step and compete to be the best in the division. This did not materialize, as Cincinnati has allowed success on over 52% of early-down passes this season, as well as a positive EPA allowed on early-down runs (the only team in the AFC to achieve such a feat). If they are going to challenge for what is a tough AFC North in the future, they will have to pair better quarterback play with improved personnel and scheme, defensively. This one appeared to be a gimme at the time, and it was the first of these to hit when the Raiders fell to 1-8 to open the season. All of the Gruden foibles (and brilliance) aside, the reason this was a play was because of the way Derek Carr trended through 2017 and how we thought he would play this year. He continued being a third-tier quarterback in 2018, generating positively-graded throws on just over 20% of his attempts and big-time throws on fewer than 4% of his attempts. With the league’s worst defense (+0.22 EPA allowed on early-down passes) as a companion, this was a recipe for disaster by the bay. This was a loser, but it’s a recommendation we’d likely make again. The aspect that we not so much overlooked, but chose to (wrongly) undervalue, was the strength of Houston’s schedule. The AFC South wasn’t the league’s weakest division, and the Colts have emerged as a legitimate threat. However, the Jaguars (as we predicted) regressed, but far more than we envisioned. It took the Colts starting 1-5 (including a gut-wrenching loss at the hands of Houston at home) and questions about Andrew Luck’s arm strength to emerge before they surged into playoff contention. Both the Texans’ start (0-3) and hot streak (nine-game winning streak) were noisy, with Tennessee needing a personal protector touchdown pass to propel the Blaine Train to victory in Week 2, and one-score wins against Indy, Dallas, Buffalo, Denver (great job, Vance), Washington and New York on the ledger that could have really gone either way. Houston’s pass protection has been as bad as we thought it would be, giving Deshaun Watson league-high pressure rates at the position (44.4%). However, DeAndre Hopkins has been the league’s most-valuable non-quarterback, and sometimes that’s enough during a 16-game season. The Jets, like the Texans, were projected to have one of the league’s easiest schedules. That has come to fruition but has not mattered. The average PFFELO rating of a team the Jets have played has been 1495.8, which is the third-easiest in the league (ahead of only the Colts and the Bears). Sam Darnold has improved markedly the last three weeks but has produced negatively-graded and turnover-worthy throws at too high a rate (15.2% and 4.4%, respectively) to compete consistently in what has been a better-than-expected AFC. Even with all of this, it’s hard not to wonder how much different the season could have looked if they had pulled out one of their two one-score losses to the Dolphins, if Baker Mayfield didn’t come off of the bench and beat them in Week 3, if they didn’t lay an egg against Matt Barkley and the Bills at home, or if they had finished the job against the Titans, Texans or Packers in December. It’s hard to say what 2019 has in store for the club. As we alluded to in the preseason, the trade to acquire Sam Darnold was not positive EV, meaning that even if he becomes a quality franchise quarterback, the picks that they gave the Colts as a result of their pre-draft trade will be hard to replace adequately moving forward. This is a pick which we have a) never been more convicted of and b) never received more flack from #online. The acquisition of Saquon Barkley with the second-overall pick in the NFL draft was received with much fanfare from #footballguys, and any dissent from people like us was openly derided. The Giants’ odds to win the Super Bowl were as bullish as 30/1 in some places at sometimes, and this under was priced to reflect the OVER money that was taken. As it turns out, Barkley was brilliant (over one WAR), and it didn’t matter. Eli Manning didn’t take the George Chahrouri-approved next step, and played at late-career levels (again), generating -0.01 EPA on all pass attempts and generating turnover-worthy throws at a rate one percentage point higher than his rate of big-time throws. The acquisition of Alec Ogletree and others did not bring the defense back to 2016 level, and the hiring of Pat Shurmur, while appearing more encouraging as the season progressed, will ultimately bear fruit in a season after this and not in 2018, as the hopefull projected. This one looked dead in the water at 1-5, but eight wins in nine games has the Colts not only well over this win total, but in position for the postseason, either via a Wild-Card berth (with a win over Tennessee) or through their first AFC South title since 2014 (with a Houston loss). Andrew Luck is fourth in the NFL in WAR (5.88) through 16 weeks, generating +0.15 EPA per pass attempt while getting credit for a big-time throw on almost 5% of his attempts. With a one percent chance to win the Super Bowl going into week 17, this has been a tremendous turnaround for Frank Reich and his coaching staff. What’s unfortunate is that their late-season run here will likely mean that the OVER on their 2019 win total won’t have nearly as much value as that for 2018. So, we were 3-2 on printed over/unders, with another hit with the Indy pick. 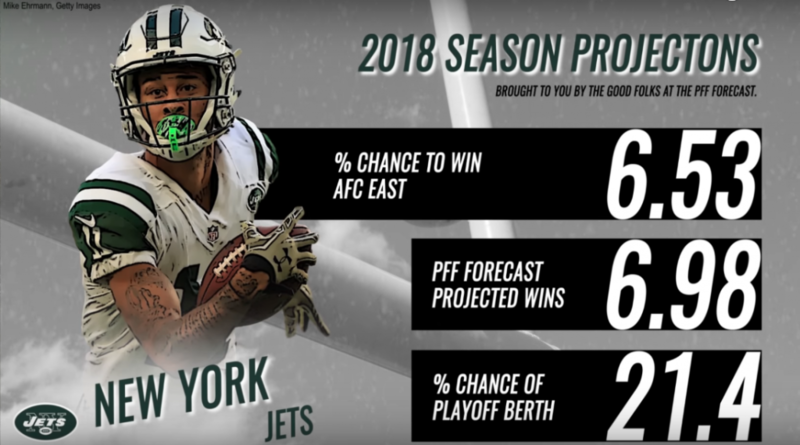 Hopefully next season we’ll able to find some more value on these totals, and get a little bit more luck to avoid the fates of our Houston and New York Jets picks.